We still don't know why Luke Skywalker is on that lonesome island on a lonesome planet at the end of Star Wars: The Force Awakens. Presumably we'll learn a lot more when Star Wars: The Last Jedi comes out. But don't expect a thorough history of everything that happened to the (ex?) Jedi since the credits rolled on Return of the Jedi - even if all of that does exist in the mind of Mark Hamill and director Rian Johnson. 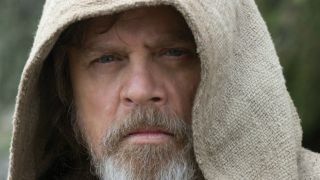 Johnson said that the first step in writing The Last Jedi was "figuring out why [Luke's] on that island". All we know is that things went very wrong with his new Jedi Order, and it sounds like Johnson had a lot of freedom to take the story wherever he wanted beyond that. I mean, if I was accidentally responsible the rise of a new Dark-Side prodigy who seems set to repeat the endless cycle of galactic suffering, I'd probably get a bit withdrawn too. Don't miss these new Star Wars: The Last Jedi images if you want some more visual teasers of what's to come. And check out our full Star Wars: The Last Jedi recap article for more info.